MEISSNER: Well, good afternoon. I would like to welcome you to this Council on Foreign Relations meeting, “The Migrant Caravan: A Policy and Public Affairs Challenge.” That’s a big title. My name is Doris Meissner. I’m a senior fellow at the Migration Policy Institute, and I’ll be presiding over today’s discussion, and I hope not presiding as much as basically having a conversation because the guest that I’m about to introduce, Eric Schwartz, is somebody with whom we’ve done business on many issues over many years. (Laughs.) And I’m delighted to be able to introduce him to you. I’m delighted to be able to be here with him. We’ve been promising through emails to see each other since he came back to Washington and we haven’t done so, so this is our first chance to do so. So—(laughs)—thank you to the Council on Foreign Relations for facilitating that. SCHWARTZ: Can’t hold a job. MEISSNER: —for this topic. He has seen it from every single angle. He’s going to start with making some comments. Then we’re going to have an exchange, and then we’ll open it to the floor for questions and comments. So, Eric, lovely to see you. SCHWARTZ: It’s lovely to see you, Doris, and it’s lovely to see so many friends from over the years. The Council asked me to talk for less than twenty minutes, which I will do, but this is quite a vast topic. And so as I pondered over the last couple of days about what to focus on, I had to make some choices. And in any event, I will not burden you with listening for more than, as I say—for under twenty minutes. But thank you so much for the opportunity, thanks to the Council, to offer some perspectives on the migrant caravan and on issues relating to asylum. I want to offer the kind of oral presentation that I might deliver, say, to new members of Congress who don’t know this issue very well but may have seen the president’s televised comments early last month when he said that the migrant caravan was like an invasion, that he inaccurately stated that almost everybody abuses our asylum system, and said that—and said that he had told the U.S. military at the border to treat rock-throwing migrants as if they were attacking with rifles. And so let me add that some of what you will hear is drawn from, in some cases directly from, a memorandum to the president from Refugees International that I authored, as well as other RI products. Now, let me start by saying that forced migration from El Salvador, Honduras, Guatemala—the Northern Triangle of Central America—has in considerable measure been caused by grinding poverty in the region. But in recent years in particular, it has also become quite apparent that for many tens of thousands of Central Americans migration is fueled by well-founded fears of women and of children about serious abuses of their human rights, particularly fear of being targeted and threatened with death or severe harm by criminal gangs, and in the case of women as a result of domestic violence. And the evidence of this is overwhelming. Several years ago the head of the U.S. Southern Command, General Douglas Fraser, called the Northern Triangle the deadliest zone in the world outside of active war zones. Subsequently, in 2014, General Fraser’s successor, General and now White House Chief of Staff—at least for the time being—John Kelly, wrote that drug cartels and gang activities had left, again, and I quote, “near-broken societies in their wake.” A 2014 report from the U.N.’s Refugee Agency based on surveys of unaccompanied minors from Central America and from Mexico revealed that a substantial majority of kids had significant fears of serious personal harm if returned. And DHS—the Department of Homeland Security’s own statistics reveal that a high percentage of women from Central America risk severe mistreatment if returned to their countries of origin. I and others from my organization were recently at the border, the Southwest border, and our team heard testimony that corroborated these statistics—such as from girls and women threatened by domestic and gang violence, or from a father who had spirited his young son out of Guatemala to escape gangs intent on extorting his family and bringing the young boy into their clutches—reflecting the circumstances of so many who have fled the Northern Triangle out of fear, out of deep fear. So before considering how to deal with this particular Central American migration challenge, I think I should provide, if I was briefing members of Congress—new members of Congress, the shortest of briefs on some of the key international and domestic practices—treaties, laws—that have been established by states to deal with forced flight. The bedrock international obligation is the United Nations Convention Relating to the Status of Refugees, adopted by an international conference of states in 1951. It was focused initially on postwar European refugees, but its terms were extended worldwide by a 1967 protocol to which the United States became a party during the Johnson administration. That document defines a refugee as an individual who is outside their country of origin because of a well-founded fear of being persecuted, severely mistreated due to race, due to religion, due to nationality, due to membership in a social group, due to political opinion. The convention and the protocol, which now are sort of one document, state that refugees may not be returned to the frontiers of a place where their lives or their freedom would be threatened due to any of these grounds. And U.S. law implementing obligations under the Refugee Convention and the Refugee Protocol provides that any alien who is physically present in the United States, or who arrives in the United States whether or not at a designated port of arrival, may apply for asylum. Under the convention and the protocol, persecution can come at the hands of the state or the hands of others. And judges in the United States and elsewhere have, frankly, wrestled with how expansive these five categories should be, especially when it comes to determining who is in a social group. But it’s really important to understand that providing individual asylum is hardly the end of the story of how governments provide protection to people in flight. Today there are some twenty-five million people around the world who have been forced out of their countries of origin by persecution and conflict, and the vast majority will not go through any individualized refugee determination process. Yet, we know—we know in our hearts and we know in our heads—that their return is just not possible. In some cases the United Nations Refugee Agency has declared large groups of people in flight to be prima facie refugees, refugees at first impression. And UNHCR, the Refugee Agency, has asked governments not to force them back. And in Africa and in Latin America, governments have actually agreed to include in their legal definition of refugees people who are fleeing widespread disruptions of public order. And domestic law and practice around the world, to some considerable extent, has followed suit. From Germany and Turkey to Jordan and Uganda, and even the United States, a variety of laws provide protection and rights to those individuals who might not meet the 1951 Convention definition of a refugee, but should not be returned to their countries of origin. The second reason why this information about the evolving way in which countries are providing protection is important is it helps us to appreciate that while Central American migration to the United States represents a policy challenge, it’s not really a crisis. In fiscal year ending September 30, 2018, U.S. border protection apprehended just over 396,000 individuals between ports of entry at the Southwest border, and that’s a large number. That is a large number, but it’s not an extraordinary number. The annual rate of border apprehensions in recent years has averaged about 385,000. To use another example in this vein, we do indeed have a backlog in immigration courts of asylum seekers. It’s hard to make a precise estimate because not everyone in the backlog is an asylum seeker, but estimated at over half a million. But that overall backlog of asylum seekers, as large as it is, is roughly on par with the more than six hundred thousand people who overstayed their visas in 2017 alone. Nobody has called that a crisis. So, if it’s not a crisis but rather an ongoing policy and public affairs challenge, what exactly are the components of a responsible approach that addresses migration management, is consistent with U.S. law and our treaty obligation, reflects more than a modicum or even a modicum of humanity, and might even offer the prospect of greater regional stability? The answer, of course, for anyone who’s ever worked in this area and has ambitions to include protection as part of your responsibility—if that’s part of your responsibility in this area, then the answer, of course, is complicated. It’s a complicated challenge and it demands a multifaceted approach. On protection, the Trump administration should cease efforts to block access to asylum. American officials shouldn’t be telling asylum seekers they can’t apply for asylum in obvious violation of U.S. law. They shouldn’t inform thousands of asylum seekers at ports of entry that their cases can’t be processed in a timely manner and they have to come back at another time. They shouldn’t criminally prosecute asylum seekers who have entered the United States between ports of entry. And they—and they should not dramatically limit access to the benefit of asylum for those who cross between ports of entry, as a presidential proclamation seeks to do. They should not take these—they should—they should avoid these actions not only because they violate U.S. law or legal commitments to which the United States has acceded, but because they put asylum seekers at grave risk of exploitation or worse at the hands of criminal gangs in northern Mexico; and they break faith with Mexico, which is already hosting thousands of Central Americans formally seeking asylum and unknown numbers who are simply taking refuge in Mexico. But injecting this degree of humanity into policy will not completely solve the problem, the challenges relating to migration, so let me suggest several other measures as well. First, as I and eighteen other former senior U.S. government officials argued in a letter to Vice President Pence and then-President-elect López Obrador on November 30, there are a number of actions the United States could to effectively—to more effectively manage asylum-processing challenges. And if I may quote from that letter: “By strengthening Customs and Border Protection processing capacity at ports of entry, by increasing the number of immigration judges who can hear cases, by implementing alternatives to detention that have been proven to be effective, and by moving forward on a range of measures to reduce the asylum backlog.” And these last measures, described in a report by the woman to my left—co-authored by the woman to my left—I didn’t know when I wrote this that she was going to be presiding, but that’s good news—they include permitting asylum officers, rather than immigration judges, to initially consider credible asylum claims that have a high likelihood of approval and a range of other measures described in a report by the Migration Policy Institute. Second, the administration needs to dramatically increase support to Mexico to enable it to process, to protect, and to support asylum seekers. As written—actually, as written, Mexican law and policies offer broader protections than those provided under U.S. asylum law. And enhanced Mexican capacity would lessen migration pressures on the United States. Third, the administration should expand support for what’s known as the Protection Transfer Agreement, whereby asylum seekers from the Northern Triangle can obtain temporary refuge in Costa Rica and then can be processed for refugee admissions, not only in the United States, not only in Canada, but in other countries. I’d go even further than that. As migration scholar Roberto Suro, formerly of The Washington Post, has suggested recently, the United States should consider a special immigration initiative focused particularly on Central Americans, a program that would create a far more orderly and legal migration path from Central America to the United States, especially since many Central Americans who are migrating have family members in the U.S. Again, the numbers are not huge, and with an orderly channel established that would address issues of crisis. And this sort of solution is similar in many ways to something we did in the mid-’90s with the government of Cuba for the regularization of migration efforts, and we can talk about that. Fourth, the administration should dramatically increase assistance to enhance protection upon return to those who are deported to Central America who may not qualify for asylum, but may still be at grave risk. It’s just not moral, it’s just not acceptable, to be deporting people, you know, to places in Central America where they will be returning to grave risk of targeted violence unless we are, you know, in a position to substantially increase efforts to provide greater protection for those who are being deported. Sixth, the president should appoint a special envoy for Central America and dramatically increase assistance to promote governance and development. Vice President Pence recently told Central American governments that the United States is committed to their prosperity, but the administration proposed significant fiscal year 2018 and ’19 development cuts to the region. And so we have to—you know, we have to put our money where our mouth is on these issues. Finally, and in some ways most importantly from my perspective, and maybe least likely to be achieved, the administration should lower the public temperature on this issue. You have to say what should happen even if you don’t have a high confidence that it’s going to happen. The highly-charged rhetoric that vilifies the asylum-seeker population tends to foreclose humane and effective policy options, tends to foreclose policy discourse based on evidence, not to mention increasing fear and uneasiness within the Hispanic and other minority communities in the United States. Now, all this—while all this is terribly unsettling, it’s also not the first time in our history that such rhetoric has infected our politics. There was anti-Irish Catholic know-nothingism and yellow peril anti-Chinese sentiment in the 19th century. There were anti-Semitic rants of Father Charles Coughlin, who had tens of millions of followers, and the tragedy of Japanese internment in the 20th century. There have always been voices of intolerance stoking fear and ignorance, and the language of threat and invasion really is not new. 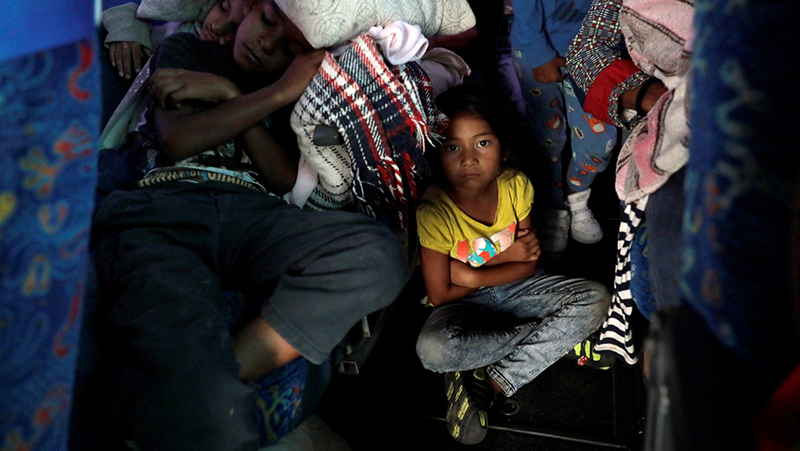 The targets just—have just shifted in the 21st century to Muslims and Central Americans. To be sure, in our lifetime we just haven’t had—we haven’t had a president whose words have reaffirmed these kinds of sentiments, and that makes today’s challenge more significant and more substantial. But to my mind, that only reinforces the imperative—the imperative for other leaders to come forward, to decry expressions of fear and intolerance, to focus on an evidence-based policy, and to trumpet values that have really animated our national narrative and given strength and purpose to the American role in the world. Thank you. MEISSNER: OK, Eric. There are lots of themes in there for people to be making notes about and thinking about in terms of questions and comments. I’m going to start off with a few, and then we’ll turn to the rest of you here. This is about the caravan, so let’s start with the caravan, and caravans, because this phenomenon of large-sized caravans is quite new. Before the current one, which became such a feature of the midterm elections and the rhetoric that you’re describing, there was an earlier one in the spring. It was about half the size or less. And, you know, when we trace back on what is going on with these caravans, they really do have to do with safety. They have to do with migrants who are going to be migrating in one way or another anyway. But it’s far away, and it’s expensive, and it’s incredibly dangerous. And so they’ve tended to come and group themselves into groups to be safer and to reduce the amount of smuggling fees and smuggling exploitation that they may be subjected to. But this particular one really took off and became quite large. And not only became very visible, and the press swooped in on it, et cetera, et cetera. Even though the numbers are not, as you say, large, if you have seven thousand or six thousand people at one time, that is large. And we know from having been in government and the way in which public debates surrounds congressional issues, when things like that are visible and when you have a sizable number, it becomes a problem. It may not be a crisis, but it becomes a problem. So how would you—we had this experience in the ’90s with the Cubans. We had it with the Haitians. You’ve got to find a mixture of your principles, protection, but at the same time you’ve got to be concerned about deterrence because this, as a mode of movement and a new method of movement, could very well be setting in at this point. And that’s a problem. It’s a problem for any government. So how would you manage that duality—the protection, the compelling cases as you’ve outlined, along with some way of breaking that method of movement, which if it continues and snowballs is going to be a problem for any country, including the countries in between us and where people are coming from? SCHWARTZ: Yeah. I mean, it’s a—that is the question. That is the question. And—you know, and part of the challenge in answering it—I will answer it. But part of the challenge in answering the question is so many of the actions of the current administration have created the dynamic that you’re asking—you’re asking me how do I respond to it. In other words, all of the measures that I’ve described, right, should have been taking place over the past year. Most of them have not. And those that have, have been taking place at a very modest level—for example, providing additional support for Mexico. The—you know, the State Department is—you know, increased its assistance to Mexico from about $7 million to about $20 million in 2018. And maybe they’re talking about increasing that total to—maybe doubling that in 2019, right? By my lights, they would increase it by a factor of ten. And it wouldn’t compare to the amount of money that we’re spending with respect to border enforcement. So one of the challenges in answering your question is, you know, all of these measures reflect a combination of actions that, taken together, would help avert the very situation we are now confronting. So maybe the way—the most honest way I can answer your question is to say: If Donald Trump left office tomorrow, right, and I’ll just make this up, you know, President You-Name—you name the president—assumed office and put me in the White House and said: OK, Eric, this is your challenge. How do you do it? Maybe that’s the most honest way I can answer your question. And I would say to the president, you know, we have been given this gift—the gift of this—of this—what I believe is a manufactured crisis at our border. But people are coming. How do we deal with this? You know, and I think on an emergency basis, I might discuss—and this is not Refugees International speaking, this is Eric Schwartz speaking. (Laughter.) You know, I might discuss, you know, do we—do we, you know, work with the government of Mexico in an interim period—in an interim period—to provide some modicum of refugee protection so when people are—either in Mexico or in the United States—so we can handle this number of asylum claims. And if—and if, you know—you know, but that’s very—and how do we assure the safety and security of those people? How do we—how do we provide assistance to Mexico to bolster, you know, border enforcement at the southern border? So we would be dealing, I wouldn’t say in an emergency situation, but in an unusual and extraordinary situation because we hadn’t put in place the kind of policy measures that, to my mind, would have avoided the situation that we now confront. Yeah, I mean, you know, if Mexico is not seen as a viable alternative for thousands of Central American asylum seekers—and those of you who know the Mexican asylum system and the problems in that system, you understand what I’m talking about. And that’s why UNHCR is not prepared to declare that Mexico is a safe third country to which people can be returned. But that doesn’t have to be the case. We can—you know—you know, you can’t make Mexico a safe third country simply by snapping your fingers and reaching an agreement to say, OK, Mexico, you’re a safe third country. But you can move in that direction if you’re prepared to provide the kind of assistance. So what I would say to the—you know, the president on day one is, yeah, we may have to implement some extraordinary enforcement measures, but I would regard them as extraordinary. And I would say, we need to put in place these other measures. And you can’t simply say you’re going back to northern Mexico, good luck to you. You know, and—you know, and just take your chances while you’re waiting for an asylum claim. MEISSNER: So let’s talk a little bit more about Mexico, because Mexico is an absolutely key element here. Do you think that we should be striving for a safe third country relationship with Mexico? Is that too much to ask for? Is that not really, you know, given our experience—we have experience with that with Canada. You know, is that a useful aim? And the other part of Mexico, it seems to me, has to do with—well, Mexico has said it’s not going to have refugee camps. It’s not going to be—not only it’s not going to be a waiting room at the northern border, and it’s not going to be a place in southern Mexico where, you know, refugees are warehoused. They haven’t used that word, but that’s the implication. But how would one—how would one take—do the kind of an interim plan that you’re talking about? And where is there a role for the UNHCR here in IOM, or isn’t there? SCHWARTZ: Well, first of all, again, if I were—if the administration changed tomorrow and I was, you know—you know, put in charge of this issue at the White House, you know, just as President Clinton deployed, I don’t remember who, from the White House to very quickly negotiate an arrangement with the government of Cuba, I might do the same thing. I might suggest the same thing with respect with the governments in Central America, in Honduras, in El Salvador, in Guatemala, to come up with one of my recommendations, this—you know, a regional immigration that would normalize the movement of Central Americans to the United States. Not overwhelming numbers but create additional incentives for people to stay. So a number of the measures that I’ve described in this paper, I think you’d have to—if you—you know, if you wanted to have an impact on the level of unauthorized migration to the border, I think you’d have to put all these in place very, very quickly. But on your specific question, when Doris asked me whether or not Mexico should be a safe third country, under our law you can’t return an asylum seeker to a place where they’re going to fear persecution. But if you have a safe third country agreement, that’s an exception. And a safe third-country agreement means that you—that you’re confident that if you return the asylum seeker to that country—Canada, for example—that person—if that person transited through that country you can return them to that country without being in violation of your obligations. So that’s the question. And the issue—the Trump administration has wanted to negotiate a safe third country arrangement with Mexico. UNHCR I think, I’m pretty confident, would recommend against that, because I think their argument would be that conditions in Mexico in general, and in northern Mexico in particular, are not sufficiently safe for people to be returned. The government of Mexico doesn’t—apparently doesn’t have an interest in a safe third country agreement at this point. So Doris’ question is would I—would that be on my agenda? I think the first thing on my agenda—I think that would not be on my short-term agenda. What would be on my short-term agenda would be making genuine changes in the capacity of Mexico to be a more attractive place for asylum seekers from Central America. There is a big agenda there. And, as I said before, Mexico provides its—as written, its laws provide a greater level of benefits for asylum seekers than U.S. law. But part of the problem is—and, look, you know, I understand that in many respects the United States is the destination. But by the same token Mexico already has many, many thousands of asylum seekers—asylum seekers from Central America. And I think that we can make significant and substantial progress on that. And that would be my focus, if I were—if I were, you know, asked to take this on. MEISSNER: OK. I’m going to try to broaden it to refugees more generally now, and the world that we live in and where we find ourselves as a country, because refugee admissions and refugee protection has always been something where the United States has prided itself on exercising leadership around the world. And we’ve always talked about the fact that although resettlement isn’t—you know, we don’t resettle in the millions—I mean, we have over the years, but at any one particular time. The fact of resettlement is part of why we’re credible in being a moral voice and in making sure that other parts of the world and other people—as you say, most people are in protection situations. They’re not in places where they’re going either be immediately resettled or likely to go back to their home country for quite a while. But that protection is incredibly important. That’s, of course, changed with this administration. This administration has not been at all interested in refugee admissions. And even with the lowering of refugee admission numbers, they’re not even getting close to meeting the lower ceilings that they’ve established. So we’re in a very, very different place now than we’ve been historically with refugee admissions and refugee resettlement. Can you talk to us about, you’ve been in this field for so long, why is it that there isn’t more of a reaction politically and a public reaction to this very, very different depiction and policies on refugee admissions? I mean, we’ve always prided ourselves on being a country that welcomes the stranger and puts a hand out to those in need. And, you know, lots of communities have sponsored refugees over the years in many—generally through churches, but lots of other ways. What’s happened to that? Why are we no longer seeing the kind of public pressure and public support for refugee admissions that we were accustomed to? SCHWARTZ: Well, first, let me—just for folks who are not refugee Wallace—(laughs)—essentially we have two ways of recognizing refugees in the United States fundamentally. One is, you know, people who knock on our doors at our borders or people who are here, who have arrived perhaps on visas or perhaps through unauthorized entry and apply for asylum. And if they receive asylum, then we call them asylees, but under international law they’re refugees. All right, so that’s one system. And that’s what we’ve spent all the time so far talking about. But the other—the other system we have for bringing refugees into the United States, or in which refugees end up being in the United States, is just what I said. We bring them in, right? They don’t come and apply for asylum. We bring them in. They’re—of the twenty-five million or so refugees around the world, these folks are outside their countries of origin, in usually temporary and precarious situations. So as part of an international burden-sharing effort, the United States for many years, and formalized in the 1980 Refugee Act, every year determines how many of the world’s refugees who are being resettled is the United States going to bring in. And that’s the program that Doris is talking about. Every year the president makes a determination. And this is one of those few areas—maybe not few—but it’s unusual in that his is within the plenary authority—this is in the complete authority of the president. The president makes the decision about how many refugees we’re going to bring in every year. And this year we—the determination was thirty thousand. For some of us, that’s very unfortunate because whether it’s thirty thousand, frankly, or two hundred thousand, it’s not going to have a dramatic impact on—my own view is as a positive impact—not only on our—you know, on the fabric of our society and our economies—on our economy, but the numbers are so modest that it probably doesn’t make a difference—much of a difference whether it’s thirty thousand or two hundred thousand. But if it’s higher, if it’s one hundred thousand or one hundred and fifty thousand, it sends a much more powerful signal to the governments around the world who are—who are hosting literally millions of refugees that somehow the United States has skin in the game. And that’s why this annual—that’s one of the reasons why this annual presidential determination has become so, you know, politically charged. That’s why The New York Times writes about the number that the president determines. So that’s the context. Now, I’ve talked so much because I’m trying to avoid Doris’ question. (Laughter.) You know, I think that—I think that there are—I think there are a couple of reasons why—until 2015, or thereabouts, the political support for the refugee admissions program was completely bipartisan. Republicans and Democrats were, you know, extremely supportive of this program. But when I was assistant secretary of state back in 2009 through 2011, I often remarked that, to myself and to others, that support for this program was a mile wide, and really only about three inches deep. And I—you know, and I was concerned. I brought—I established a new position in my bureau, Population, Refugees, and Migration, on counterterrorism and refugees because I wanted to make sure that we were keeping an eye on that issue, and if there was discussion within the government about this issue that we would be at the table in those discussions. Because I find if you’re not at the table, decisions get made that you didn’t want to get made. And I think—I think the specter of—you know, of 9/11, which was back in 2001, but I think—and I think the Syrian exodus, and I think concerns about the Paris bombing, and, you know, I think connected the refugee admissions program to those sets of issues. And the political salience of those issues became much greater. And there was much greater expressions of fear with respect the refugee program. And it didn’t much matter that—and past is not always prologue, but past is not irrelevant—that, you know, that there still—there still is not one case. We’ve resettled since 9/11 over a million refugees. There is still not one case of a resettled refugee in the United States being responsible for an act of terror that led to the loss of an American life—not one. MEISSNER: OK. Maybe there will be some suggestions from the audience. So we’ll turn now to the audience for questions. Please remember that this is on the record. And tell us who you are. And speak right into the microphone. And we will try to take just one question per person. Don’t do multiple choice questions. If we can please ask for that. So, who’d like to ask a question? Yes, sir. Q: My name is Tom Getman, and I’m a founding board member of Refugees International. Eric, if you could have one suggestion that we all could take away to the congresspersons we know of the list you gave us—one. One that we could each take away and hammer home with a member of Congress—Republican and Democrat—I know a story from Honduras where eleven villages in a district are completely self-sufficient, no starvation of children, farm products going to market. And people who were in the caravan came back to Honduras for the harvest. One thing I’m saying to my Congress friends is, especially right-wing Trumpians, let’s support those kinds of projects in the Central American countries, that it’s going to cost a lot less and have a higher impact than building a wall. SCHWARTZ: Yeah. I mean, I think, you know, part of the challenge here is so many of the policy decisions on the issues that I’ve been discussing this morning are wholly in the hands of the administration or the courts. And the interpretation of the asylum law, for example. And all of those recommendations that I made about efforts to block asylum, they’re all being—each and every one of them is being litigated in court. And members of Congress have very limited capacity to significantly impact those issues. I would feel a little differently if—and, you know, the—if there was, you know, kind of churning within the administration on these issues. There isn’t. Policies on these issues come from a very particular place in the White House. (Laughter.) Well, they do, and that’s OK. I mean, he won—the president won the election and he can empower his, you know, White House staff. And he has. And so there’s no—there’s little churning on those issues; same thing with refugee admissions program. So I think what I would—and again, I might revise this response if I had a chance to reflect on it a little more, but I think I would focus on congressional legislation to appropriate funds for the kinds of activities that I describe, you know, even earmarking funds, although I don’t know if—the capacity of the appropriators to earmark in this area anymore. But with respect to support for Mexico, with respect to support for Central American countries—when I’ve made that comment about Central America and people being deported, they have these reception centers in Central America for people being returned, and the fact that somebody has a failed asylum claim doesn’t mean that they’re not going back to a very high degree of targeted—targeted—violence, not indiscriminate violence. And I think we have some obligations there, if we’re sending those people to that situation. So I think there’s, with respect to support for Mexico, for protection and asylum, support for Central America, for protection of returnees, and significant support for development and governance—and I say governance because, you know, that’s a critical component of this. My question is this. You’ve talked about and made a very strong case that the standard of the law and the standard of the treaties is not being followed in the administration of our policies. My question is whether your longer-term solution involves sticking with our present standards about the well-founded fear and enforcing them but actually recognizing that the numbers may be greater than you would like, or whether you believe we need a new standard, either in order to limit the number, because some people are concerned about the numbers involved, or for other reasons. But what would you do if you had your choice? SCHWARTZ: I haven’t been among the proponents of expanding the scope of the refugee convention and protocol, mainly because I have some sympathy with the view that if you put together an international meeting—(laughs)—to look at the refugee convention and protocol, you might end up with fewer protections that already exist in the document. I could be wrong about that. But I think—but I think that there may be some value, some—well, governments like Turkey, like Jordan, Lebanon, like Uganda; they are responding. They’re not sending people, you know, back to situations of conflict where they would be at great and grave risk. And we in our own law have similar kinds of—not similar but some kinds of protections in that regard—our TPS statute, for example, the administrative measure of Deferred Enforced Departure. And I guess some effort to provide greater recognition of these evolving, you know, tools and practices I think would be valuable. I don’t know whether an attempt to codify them internationally would be worth the effort, but I describe them because I think it’s important that people in the policy world know that that’s happening. And, you know, when the Obama administration, which at the time I was not a part, hosted the September ’16—September 2016 summit on refugees, you know, they—as I recall, they sought to catalog—when they were looking for commitments from governments, they didn’t just ask governments, how many refugees are you resettling; they sought to catalog the, you know, the smorgasbord—that’s the wrong word—of efforts to provide measures of protection for people, maybe through a refugee program, maybe through a labor employment program, maybe through a variety of other programs. And I thought that was very creative. And that’s what we did in the mid ’90s with the Cubans when we reached an agreement; we said we’ll take 20,000 a year. And so I guess my short answer, which I haven’t given yet, to your question is I think an effort to catalog, to take note of, to validate this proliferation of efforts would be—is valuable. Whether there needs to be a new international convention, I’m not so sure. MEISSNER: OK, let’s go to the other side here. Q: Thank you very much. Eric Jacobstein. I’m with the House Foreign Affairs Committee Democratic staff. I just wanted to ask on sort of the remain-in-Mexico proposal from the Trump administration—I mean, let’s say President Lopez Obrador were to agree to this. Is there any way in which you would view that as palatable? Is there—if you sort of included scaling up of UNHCR resources, if you allowed counsel to cross the border, if you sort of allowed immigration judges. I don’t really know exactly what it would look like, but is there any way in which you would view some sort of proposal like this as workable, or is it just completely out of the question? SCHWARTZ: My hesitancy—I’m not going to—I signed a letter, you know, from nineteen former officials, you know, opposing this kind of measure, and my reasons for opposing it have to do with several different factors. Number one, I’m not sure it’s legal, given our immigration provision regarding asylum seekers at, you know, at ports of arrival. So I’m not—and it’s going to be challenged. I’m sure it is already being challenged legally, although I don’t know that it’s been actually—it hasn’t been unveiled so I don’t think it’s—maybe it’s not being legally challenged. So I’m not sure it’s legal. I’d be hesitant to advocate something that isn’t. Number two, my fear about it is, as I said in my remarks, that—I mean, the government of Mexico—it’s not like the government of Mexico is doing nothing on these issues. You know, there are thousands of asylum seekers who are in the formal asylum process in Mexico and probably tens of thousands, if not hundreds of thousands of Central Americans who are already seeking refuge in Mexico. So it makes me wonder why—you know, what kind of burden sharing is that for us to say, OK, in addition—you know, the thousands that we get, you know, you’re also going to be hosting. And so that’s another reason why I question why isn’t—why isn’t it incumbent upon us to develop some sort of that capacity in that area? Now, I know the response to my comment, which is, well, it’s a deterrent. I mean, that goes to Doris’s—to Doris’s point. But I don’t know if that’s a compelling enough response. So I would be—and my other concern is, if you’re not wholly accountable for protection, and if it’s across the border, you’re not wholly accountable for protection, I would be very skeptical about our capacity to ensure, you know, the safety and security of asylum seekers who are across the border. MEISSNER: All right, I’m going to try to get two more questions in because we’re supposed to really be punctual here. So I’m going to ask for short questions and short answers. SCHWARTZ: OK. You got it. MEISSNER: This one here and then one from the table back there. Q: Thank you very much. Sarah Kreps from Cornell University. You’ve talked a lot about the U.S. administration, but there’s a new administration in Mexico and I wanted to hear more about your thoughts on the opportunities and constraints of the Lopez Obrador presidency, because he himself is coming to power at a time sort of—and representing this very populist view, so you can imagine a sense that overreaching support for Mexico on the part of the U.S. might be seen as neo-imperialism or—I’m curious to hear more about that perspective. SCHWARTZ: Well, I’m not—I’m not a Latin American or Mexico expert, but I’ve reflected on the same thing, and you know, I think—sure, OK, I think the government of Mexico might be reluctant to be seen as, if I can use this term, kowtowing to, you know, America’s, the United States—the views of the administration on this, and that might suggest against not only, say, a third-country agreement for sure but also the kind of arrangement that this gentleman from the House Foreign Affairs Committee was asking about. Also, the president’s, you know, connection with the poor, the vulnerable, the disenfranchised might translate into a concern for Central Americans, but I also wondered whether, you know, whether that might be Trump, you know, nationalist concerns. I just don’t know. So that’s what I thought about it. But Doris said I have to give a short answer, so that was that. MEISSNER: OK, straight across, then over here on the right. Q: Me? OK, thanks very much. I’m Dan Runde. I’m at CSIS. Q: Thanks very much. I really like this memo. I think it’s great. And just a couple of quick comments: I think we have to operate as if—that there’s a hardening of borders, whether one likes it or not, I think with OECD countries. I think this is—I think this is a new normal, and I’m not sure exactly how to deal with it, but I think that is something that I think we need to think about. I want to make two points about development that I completely agree with your comments and would just welcome your reflections on it. One is, I think we absolutely do need to continue to have significant resources in the region to support development and governance. I agree with you. There’s a magic number; I’ve seen this number. I think the Center for Global Development had this number that says immigration out of a country increases until it reaches around six thousand, eight thousand dollars per capita. Now, it accelerates as it gets closer to six thousand (dollars). My argument is, well, let’s move—(laughs)—as fast as we can to get countries as fast as possible to that magic number. So I would just welcome any reflections you have on any of my comments I just made. SCHWARTZ: I just have a few reactions. Number one, I agree with you. Number two, in the Central American context, I believe that governance has got to be part of the equation. I think USAID has learned that lesson and re-learned that lesson and re-learned that lesson, that, you know, without efforts to enhance governance, efforts to promote economic development by themselves are not going to be adequate, and—but I also think you’ve got to deal with violence issue. So I agree with you. I also understand the issue of hardening the borders. And I’m—on one level, I’m sorry we didn’t get into a conversation about the wall, because, you know, no responsible person in public life can say that, you know, we should not make serious and substantial efforts at border enforcement. I mean, governments have that obligation. But I think there are tricky issues, and I know that’s not your question, but I think there are tricky issues and I think my concern about—my fundamental concern about the wall—I’m going to treat it as a serious policy recommendation—is it’s come forward without evidence-based judgments about, you know, whether the costs, whether the benefits outweigh the costs and what some of the unintended but completely foreseeable implications of that wall are going to be. So I don’t think you have to be in favor of the wall to be in favor of border enforcement. Unfortunately, that’s the way the political discussion, you know, has moved in this country. And I think those who are in favor of thoughtful and informed immigration policy have got to be able to, you know, be supportive of border enforcement and not—the litmus test of support of border enforcement cannot be whether you support the spending of twenty billion dollars or more on a border wall which, you know, which the best analysis suggests will have unintended and very damaging impacts on our objectives with respect to development in the region, with respect to crime at the border, and other issues. So I realize we could spend another hour and a half talking about it, but I wanted to get that point across. MEISSNER: Fair point. Very fair point.